This is an old classic recipe. 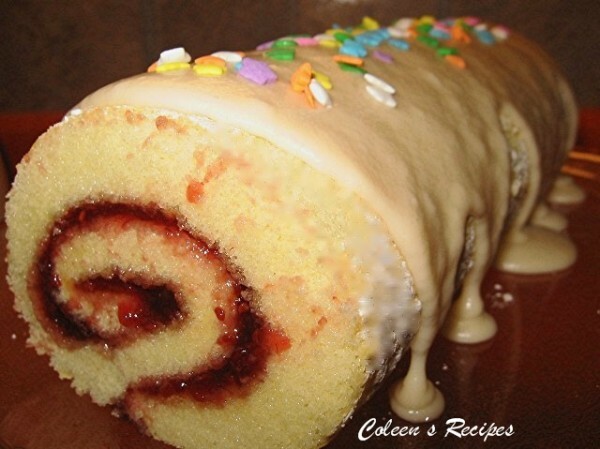 I see variations of it online (with a whipped cream filling) however, this recipe holds true to its name JELLY roll, and was filled with jam. It is definitely a crowd pleaser. This one is made with my raspberry preserves and it is one of Picky Picky Hubbies favorites. Preheat oven to 375°. Line a 10” x 15” jelly roll pan with parchment paper and spray the parchment paper with cooking spray, set aside. Beat the eggs, on high speed, until very thick and lemon colored (FULL 5 minutes). AFTER 5 minutes, gradually add sugar while the mixer is running. Put butter extract into a 1/3 measuring cup and then fill the rest of the measuring cup with water (water + butter extract should = 1/3 cup). Add vanilla and water/butter extracts to batter and mix well. Add flour, baking powder and salt to the egg mixture and beat just until batter is smooth. Pour into the prepared pan. Bake 12 to 15 minutes or until toothpick inserted in center of cake comes out clean. Slide a knife around the cake edges to loosen it from the pan. While cake is still hot, turn it out onto a large sheet of parchment paper (a couple inches larger on edge side) that has been spritzed with cooking spray and gently peel off the old parchment that you baked on. Gently roll up the HOT cake along with the (new) prepared parchment. Set it, seam side down on a baking rack to cool for 45 minutes. When it has cooled for 45 minutes, unroll the cake (gently peeling away the parchment). Stir the preserves well, to get them all loosened up (if jam is very thick, add a tablespoon water and stir), then spread it on the cake (to within an inch or so of edges). Gently roll the cake back up (with NO parchment this time). Wrap the whole thing in plastic wrap and let it cool completely. 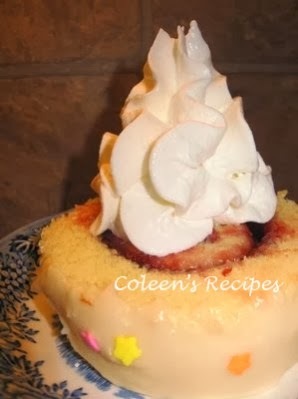 When cooled, take plastic off and top with glaze or whipped cream. Whisk everything together. If it seems too thick, add another tablespoon of milk. If it seems to thin, add a few more tablespoons of powdered sugar. Spoon glaze onto jelly roll and let it drip down sides. NOTE: The cake will continue to get more and more moist (the moisture from the jam works its way through the cake). So the jelly roll will be at its prime after it has been covered a few hours. 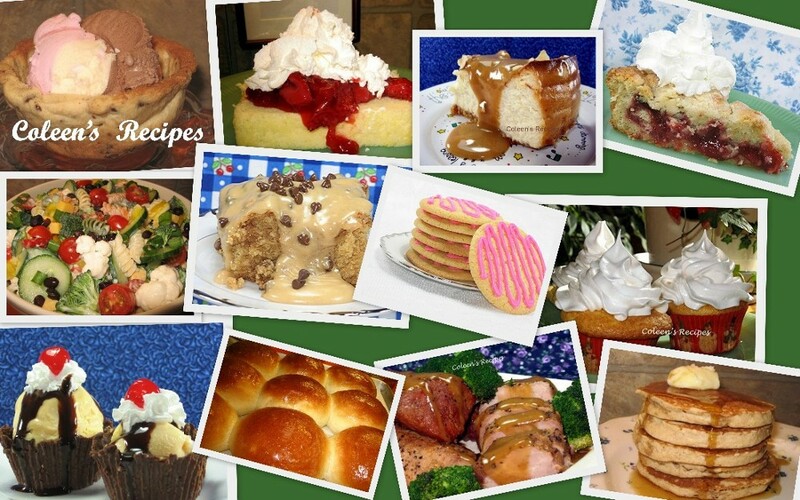 Some cooks feel intimidated by jelly roll cakes, but this recipe is nearly a foolproof. The main trick to rolling cake is that it has to be a special sponge type cake to work (don't just try ANY old cake recipe). Remove the HOT cake from the pan and trim any dry edges (that will keep it from cracking when you roll it). Roll the cake AND THE PARCHMENT up immediately, don't let it cool down. Let it sit for a full 45 minutes then unroll and spread jam and roll back up immediately. Lay it on plastic wrap and wrap tightly. This will help also help the cake from mis-shaping while it cools (although I've never had a problem with that). The biggest trick is to get the cake right in the first place. Whip those eggs a full five minutes. The pan size is another thing. For this recipe it HAS to be a 10x15. A thinner cake rolls easier than a thicker cake. If you don't have butter extract...just add an extra teaspoon of vanilla OR a teaspoon of rum extract. Absolutely beautiful! 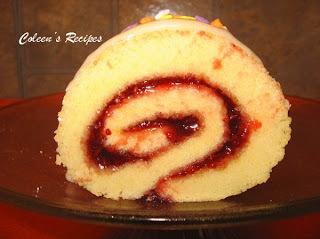 I love jelly rolls cakes. I've made pumpkin rolls and it wasn't nearly as difficult as I thought it would be with the rolling and all...you know I'll be trying this one! This reminds me of my grandma. She always made jelly rolls and I miss her so much. Thanks. I've always been scared to try to make a jelly roll. However, you got me through my fear of all things yeast so maybe I will give this a go, too! It looks lovely, Coleen. Coleen, this is one of my all time favorite desserts of my childhood. My grandmother used to buy jelly rolls exactly like the one you made and I was crazy in love with them. I have to get up my courage and try this. Oh what sweet dreams and memories this brings. Perfect for Mother's Day!!! You are so awesome!!! so beautiful! i could eat it for breakfast! Lat last picture is perfect. THanks for all the tips too. To Anonymous: I used an electric mixer for the whole recipe.